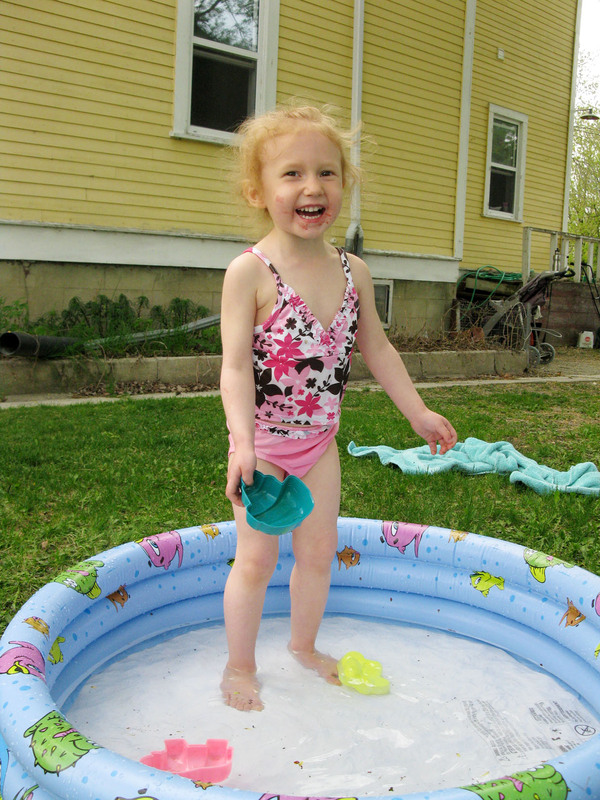 Summer Is In The Air | Live. Learn. Love. Eat. I haven’t been keeping track of my weight for my pregnancy because I just find it better not to focus on any numbers and just let my body do what it is going to do. I remember getting obsessed with numbers in the past and know that can be a trap for me. I eat healthy foods when I am hungry and don’t worry about calories or any other numbers, but on whole, nutritious foods that my body can build a strong and healthy baby from. Things like whole grains, beans, tofu, fresh fruits and vegetables and of course my home-baked vegan goodies. I listen to my body for what it wants, when to eat, exercise or rest. This is truly the best way to live and I highly recommend it. Our bodies are wiser than we think, we just have to learn to listen to and trust them. My baby has got to be loving this because he/she kicks ALL THE TIME! I also always have music playing in the day, mainly Jack Johnson, but also Ben Harper, Eddie Vedder, Darius Rucker and Coldplay. I wonder sometimes if the baby will think Jack Johnson is his/her daddy. 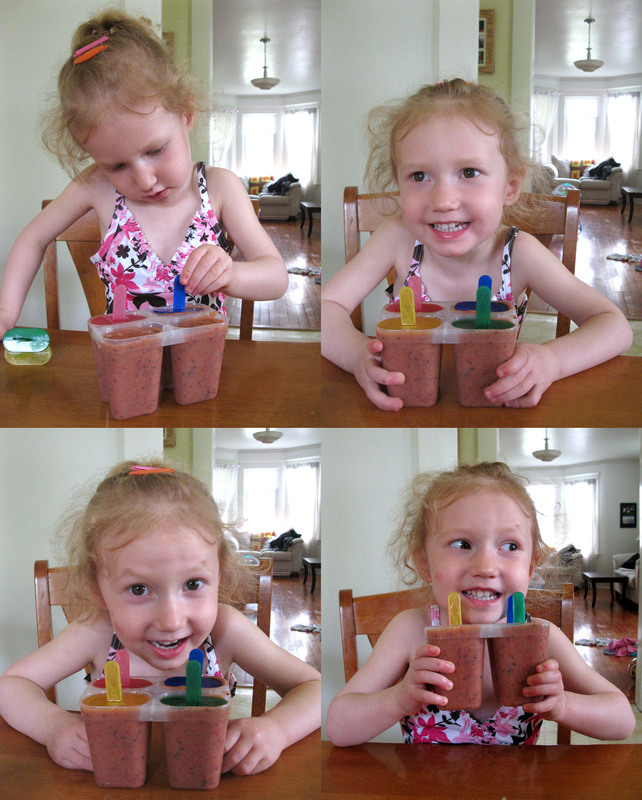 After a long, hot walk this morning, I took my little princess to the store to get some strawberries and kiwis so that we could make some homemade frozen fruit pops! 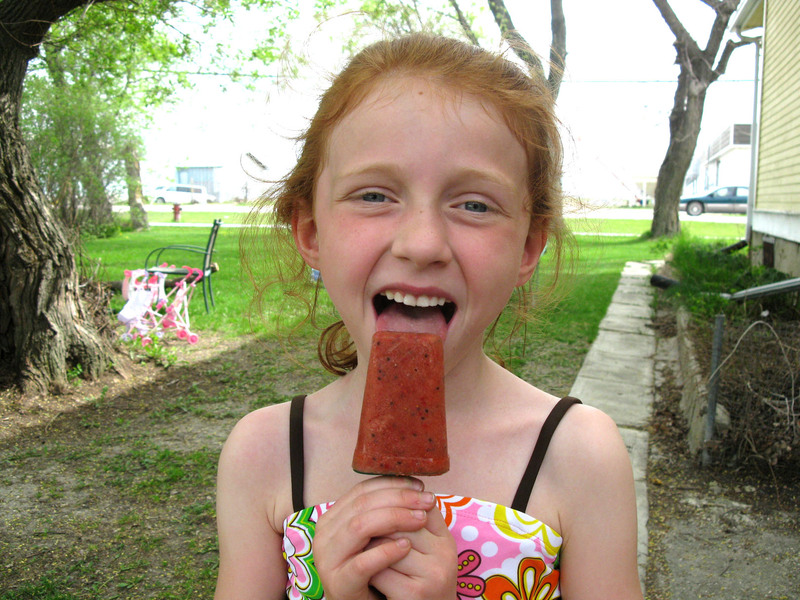 This easy, frozen, sugar-free treat is perfect for hot summery days. 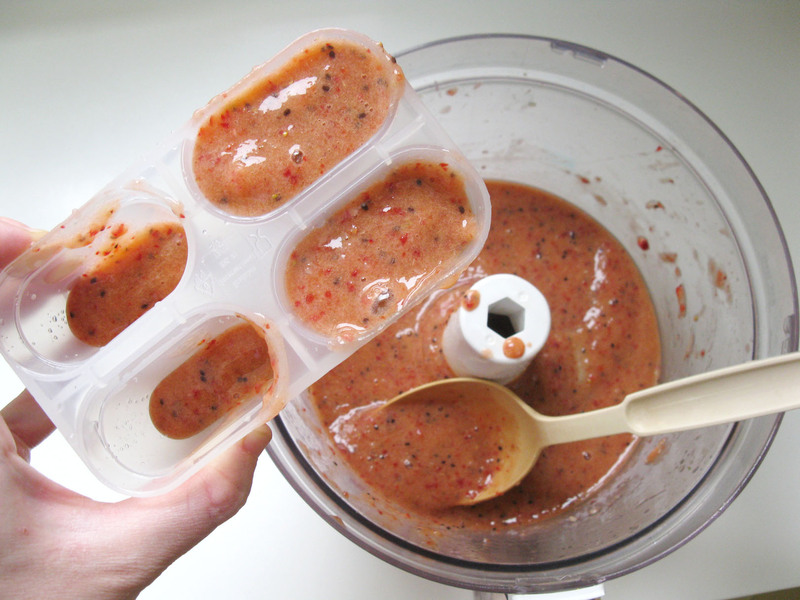 Made with pure strawberry and kiwi puree it is a great snack for kids and adults too! 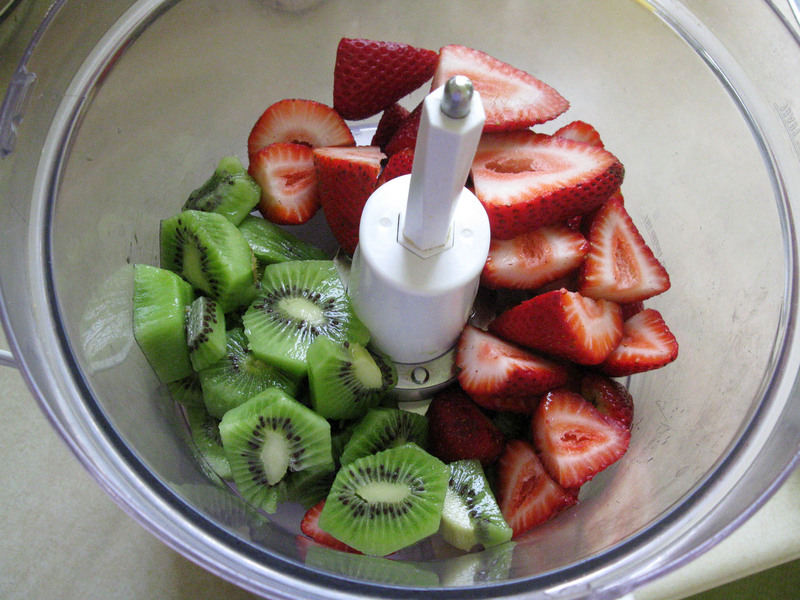 Place the strawberries and kiwis in a food processor and process 1 minute or until smooth and pureed. 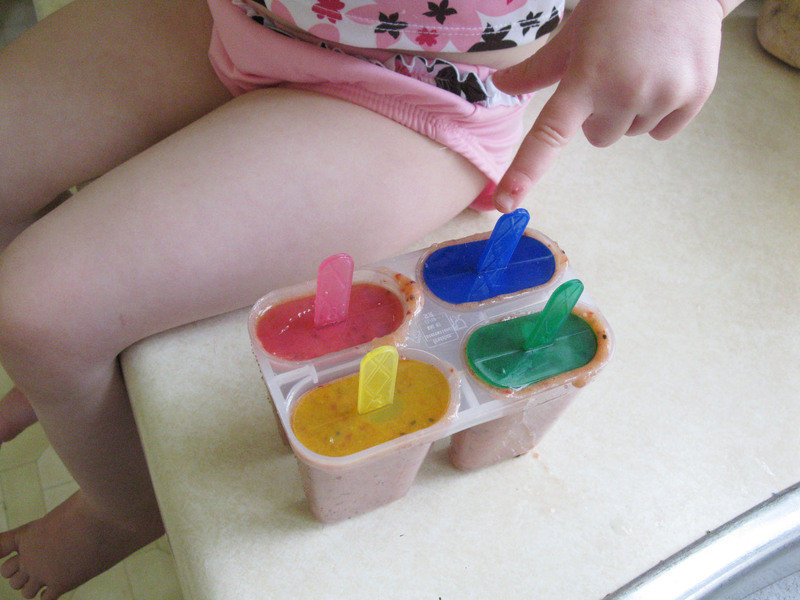 Spoon the pureed strawberry/kiwi mixture into 8 popsicle molds. Place in the freezer to harden, at least 2 hours. 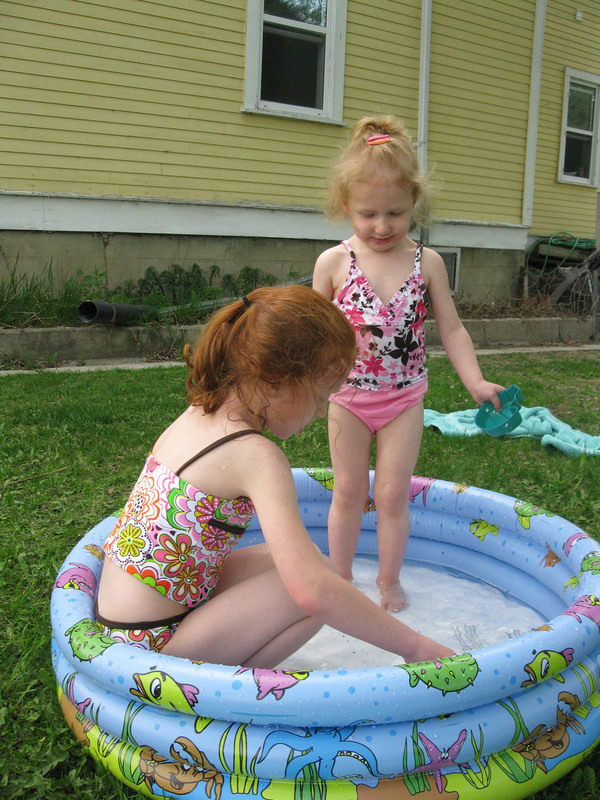 We have had crazy beautiful weather all week long and the girls spent this afternoon in their bathing suits wading around in the kiddie pool to cool off. Today we also got the garden planted. 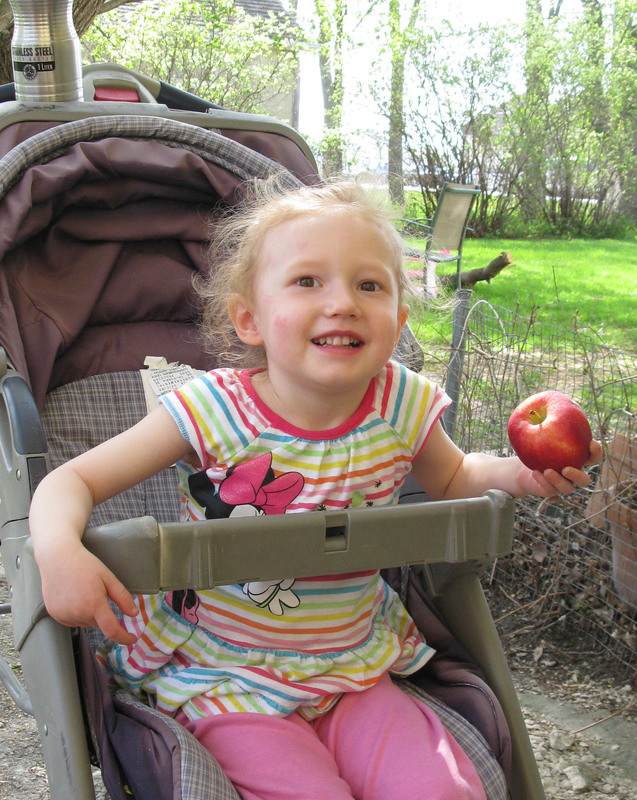 I love when summer is in the air because of all the fresh produce that is available, especially corn on the cob! 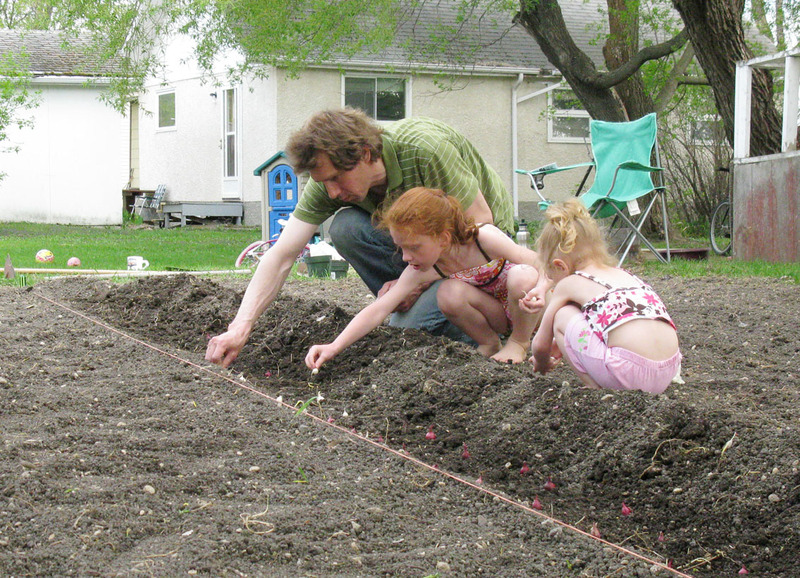 I am also totally looking forward to whatever we get from our garden this year as well. 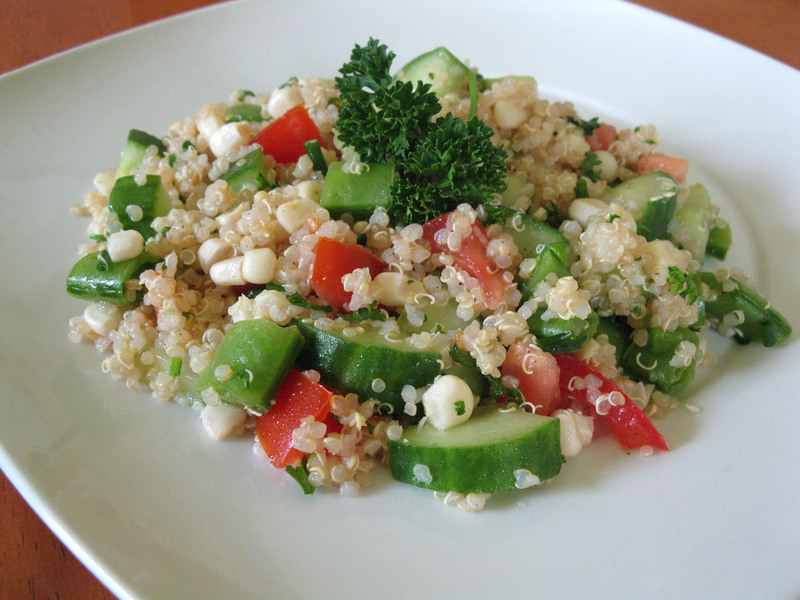 For a refreshing light dinner, I made this beautiful Summer Fresh Quinoa and Corn Salad. Salads are great, but grain salads are even better! 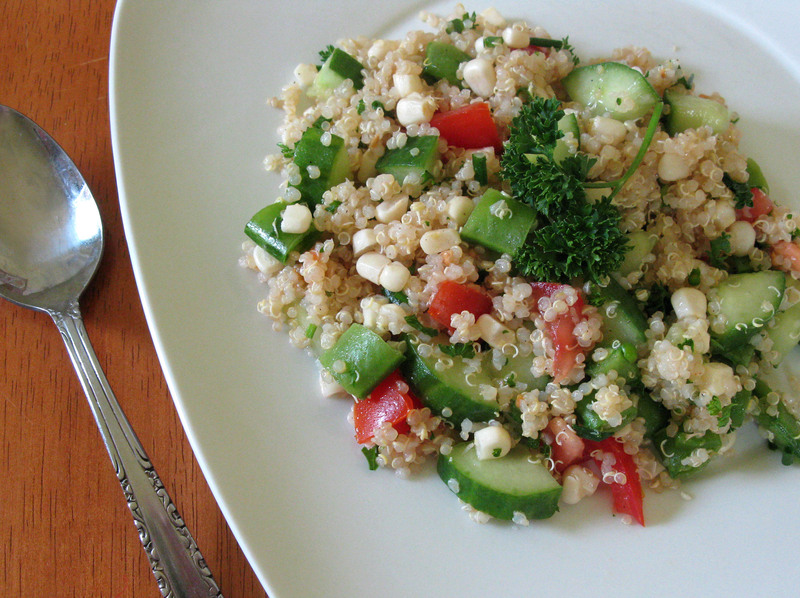 This salad is made with quinoa, corn, fresh summer veggies, chives, parsley and a touch of citrus. A perfect salad on a hot day. Rinse the quinoa before using and combine with the 2 cups of water in a medium saucepan. Bring to boil, reduce heat, cover and simmer for 20 minutes. Remove from heat, fluff with a fork and allow to cool a few minutes. In a small bowl, whisk together the olive oil, lemon juice, lime juice, salt and pepper. Set aside. 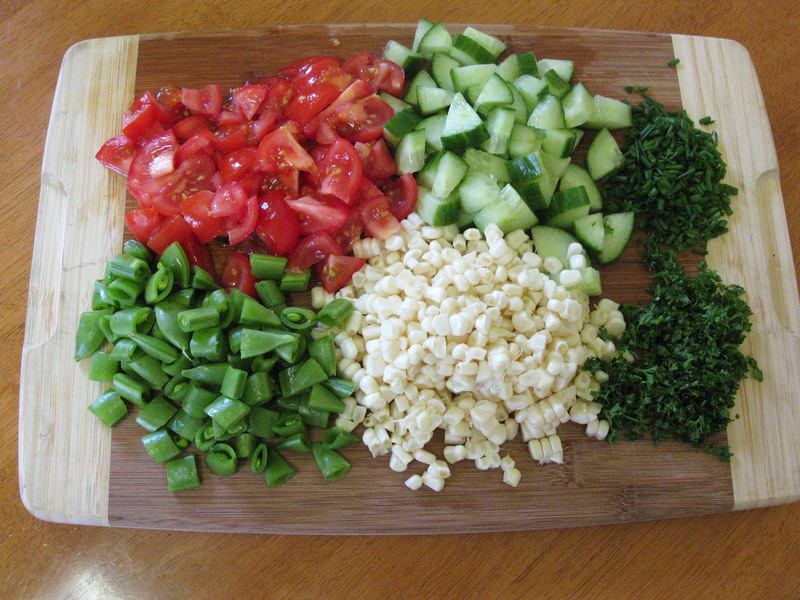 Place the cooled quinoa in a large bowl along with the cucumber, tomatoes, corn, peas, parsley and chives. Toss. Add the citrus/oil mixture and toss again. Serve or refrigerate for later. 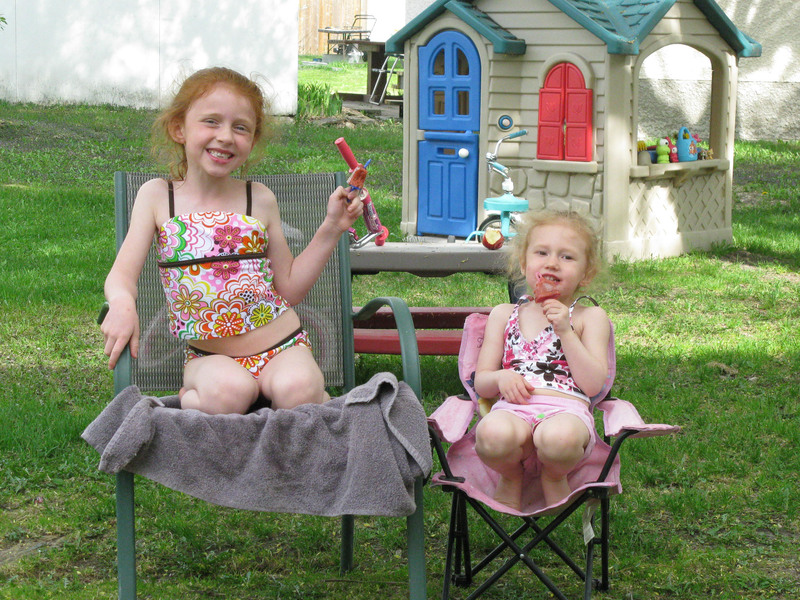 Pingback: Lemon Raspberry Freezer Pops | Live. Learn. Love. Eat.